Walking. Calisthenics. Jogging. Running. Aerobics. Weight Training. Swimming. Pilates. Competitive Sports. Yoga. Tai Chi. Chi Kung. Martial Arts. What is the difference between these two groups of exercise? The first group of exercises uses specific types of movements to move the body, either to accomplish a specific task, or to exercise specific groups of muscles to strengthen them or build them. The focus of the person doing the exercise is very specifically on the physical body. In specific sports there will be an element of mental focus to achieve a specific outcome and to perfect specific techniques required to excel at the sport. But what I find fascinating is that people who exercise in a gym need to watch a TV or listen to music to keep their mind engaged. There is absolutely no link to their body whatsoever. Whether they’re running on a treadmill or through a park, most people nowadays are plugged into their music, podcasts or whatever and do not even notice what they’re doing. They were told that they need to exercise and that’s what they’re doing, right? With no presence. No mental participation. They are not in touch with what is going on in their body, at all! Mindless exercise. The practice of the second group requires another element though. That of the calmness of mind and the flow of breath and energy through the body. It requires the practitioner to direct their focus into their body. They have to become aware of their body and the flow of movement through it. It fully engages the mind and brings the person doing it fully into the present moment and present in their body. Mindful exercise. Not just empty movement with no link to mind, emotion and spirit. 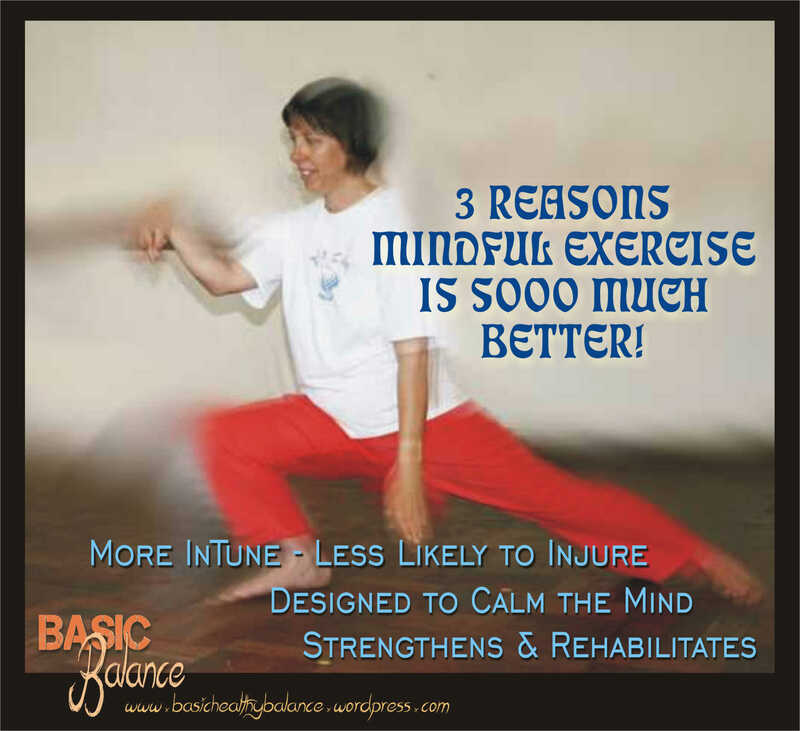 Mindful exercise requires the full participation of all aspects of being: body, mind, emotion and spirit. This is exactly why I love doing Martial Arts, Tai Chi and Chi Kung. It helps to calm down my mind. It enables me to find my center or keep it and it enables me to feel my body fully. I become aware of blockages and can work to release them. It enables me to fully integrate all aspects of my being and be fully me and in the moment, no distractions. It also connects me to everything else and I can sometimes become aware of the fuller picture and how everything is connected. It is being “in the zone”, that sweet spot where everything just works and just flows beautifully. I don’t think you’ll be able to do this whilst your mind is engaged in something else. This is why I call it moving meditation. If you’re listening to music and you reach a point where that too disappears into the background, you might be able to tune in this way. I personally love the beauty in the doing and flowing of the rhythms of martial arts and chi kung, it was designed to do just that. Yoga is the same. Here you can also use the right kind of music to enhance the experience. When you’re invested this way in your exercise, you are much more in tune with your body and the stresses and strains on it and you will be less likely to injure yourself whilst doing it. If you’re doing it correctly, it is designed to strengthen you and prevent injury. Chi Kung and Tai Chi can also be used to heal injuries and imbalances and is perfect as a rehabilitation exercise. Doing it saved my life. It healed my back and leg and I have also helped numerous clients after operations and major injuries to recover and strengthen this way. Great sportsmen and women use the martial arts to achieve this harmony. Tiger Woods does Tai Chi. Lewis Hamilton is a Martial Arts Black Belt. No wonder they do so well. They have trained to find the Zone where everything just flows. They’re in harmony with their whole being. Once you have the know-how you’re able to achieve it in anything you do.